Lady with Her Maidservant Holding a Letter is a painting produced by Jan Vermeer (Delft, 1632-1675), now in the Frick Collection in New York City. The work of Johannes Vermeer (also known as Jan), is well known for many characteristics that are present in this painting. 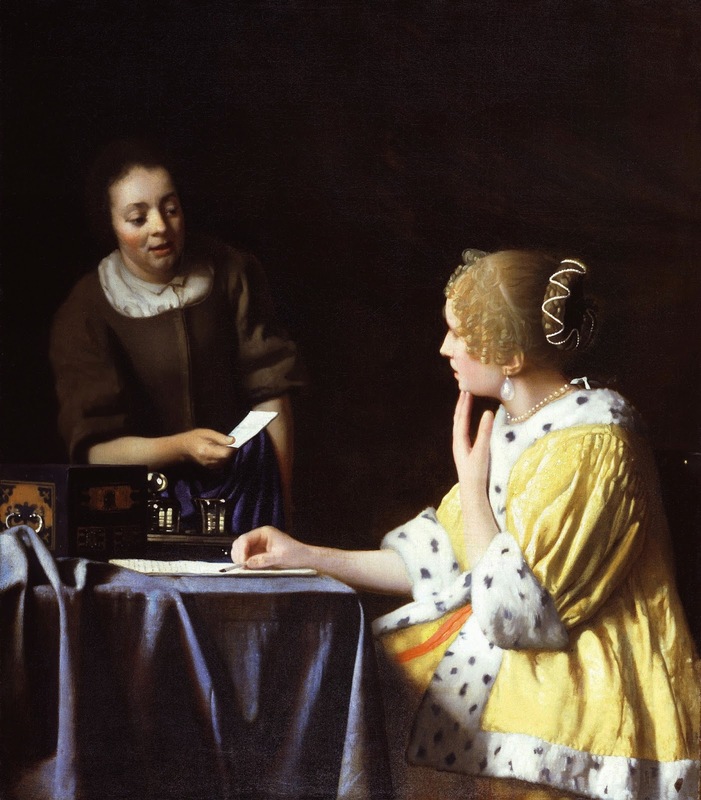 The use of yellow and blue, female models, and domestic scenes are all signatures of Vermeer. This oil on canvas portrays two women, a Mistress and her Maid, as they look over the Mistress' love letter. Mistress and Maid was painted over the years 1666-1670 on a canvas. The painting shows an elegant mistress and her maid as they look over a love letter that the mistress just received. 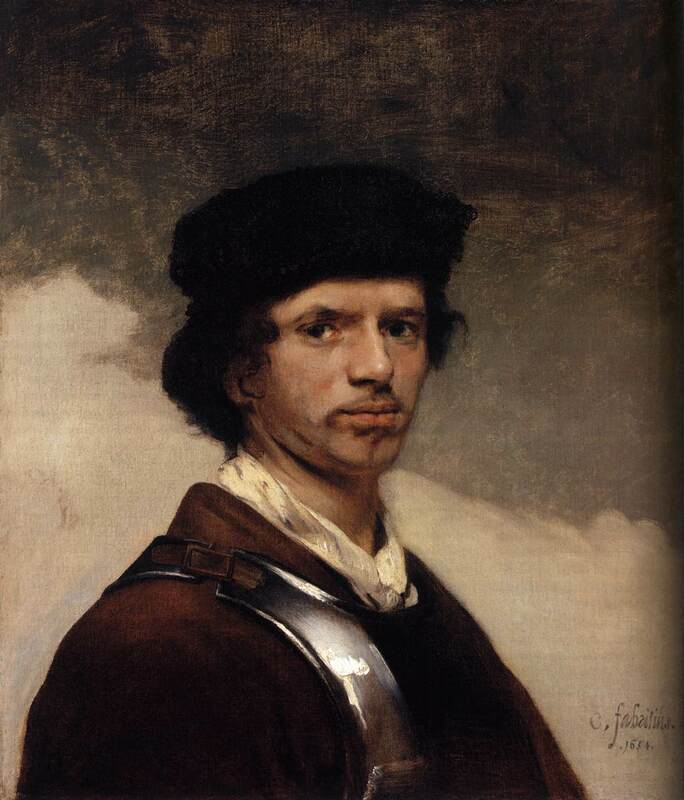 There are prominent Vermeer styles presented in this painting. There is a strong use of yellow in the woman's elegant fur-lined overcoat, and blue in the silk tablecloth and the maid's apron. The focus of the painting is the two women as they are sitting at a desk, doing an everyday activity. 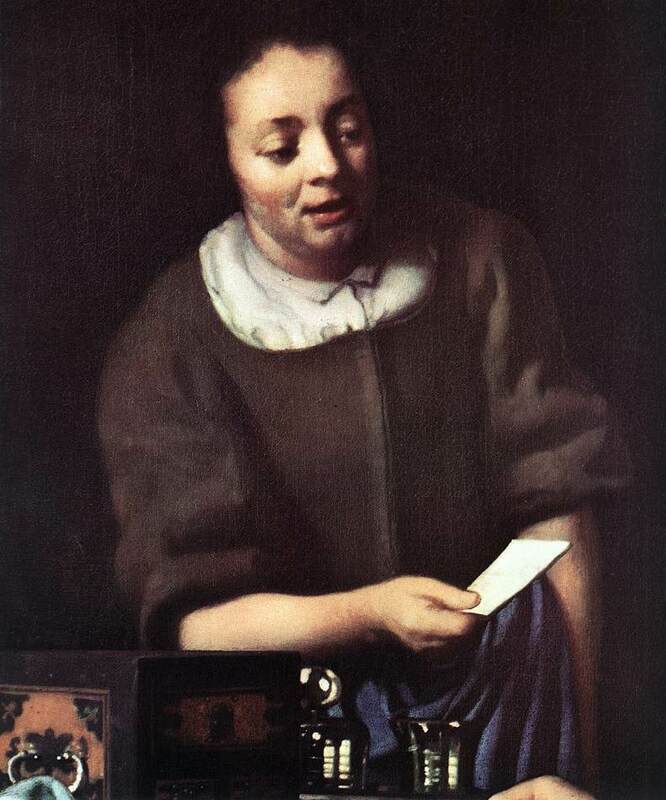 Vermeer was known for his domestic scenes containing women. The light in the painting comes from the left, and falls on the mistress' face, as is apparent from the shadow of the table on her legs. This painting can seem very straightforward at first glance, but it has deeper psychological implications. If one looks at the image straightforwardly, one sees the mistress as she looks at the sealed love letter, hinting that she has a relationship with someone who is perhaps a great distance away. There is a hinted relationship between the maid and the mistress with their furtive glances and their body language, as they lean towards each other. The mistress has a pensive gaze, with her lips parted ever so slightly and her fingertips lifted to her chin in a questioning manner. 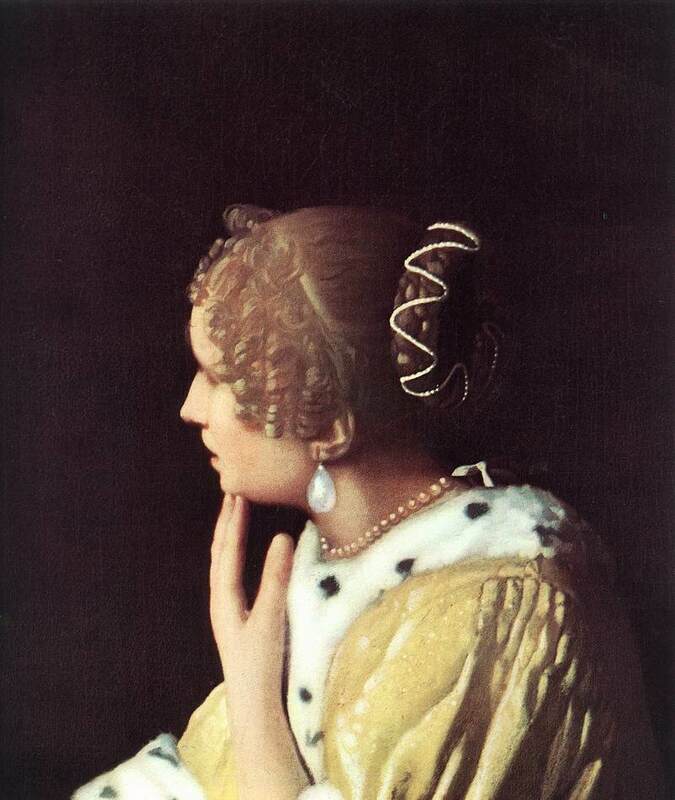 The mistress' profile is slightly blurred and undefined and is meant to portray an idea that the woman is soft and sweet. This is likened to another one of Vermeer's paintings, Girl with a Pearl Earring. The painting is preserved well and it has stylistic features such as the large scale of the figures, the dark background, and the dramatic modeling within the scene. In Mistress and Maid, Vermeer played with his medium and created texture and light with his works. For example, the lighted parts of the yellow overcoat are formed with sweeping brushstrokes of lead-tin-yellow and the shadows are created with definition. Dark backgrounds were used in portraiture after Leonardo da Vinci created the trend. They were used because they gave focus to the person in the portrait and enhanced the three-dimensional effect. 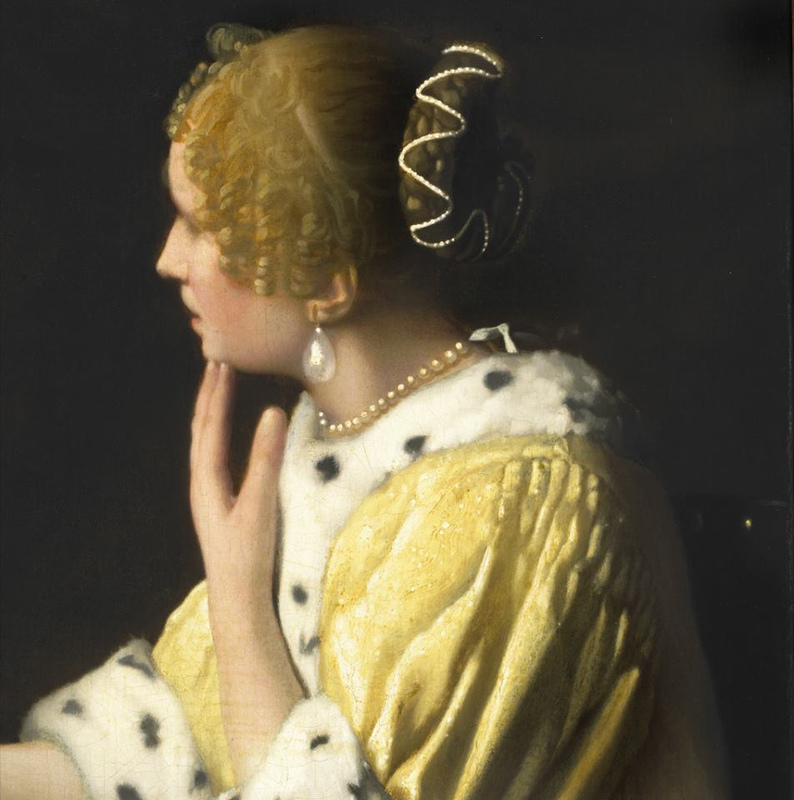 Vermeer uses dark backgrounds in his other portraits such as Portrait of a Young Woman and Girl with a Pearl Earring. 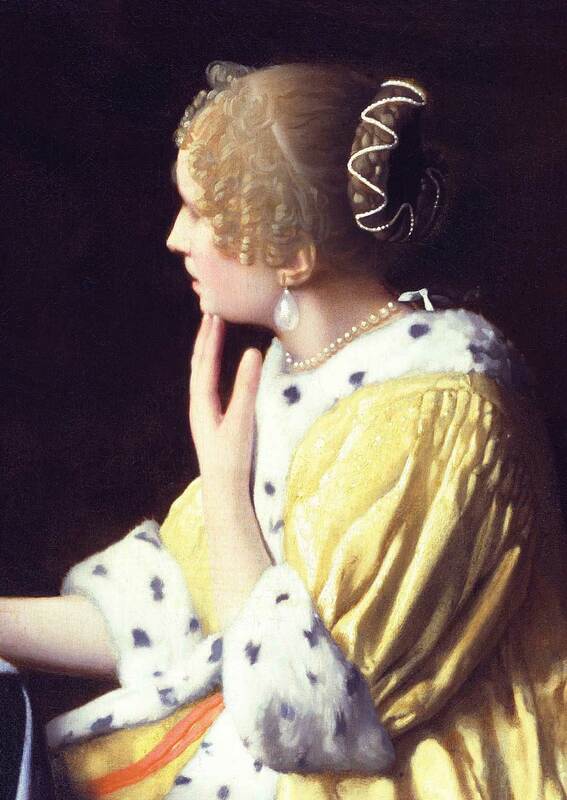 There is a prominent usage of pearls on the mistress in this painting. Pearls were an important status symbol of the period and that was reflected in the mistress' fancy attire and her abundance of pearls. 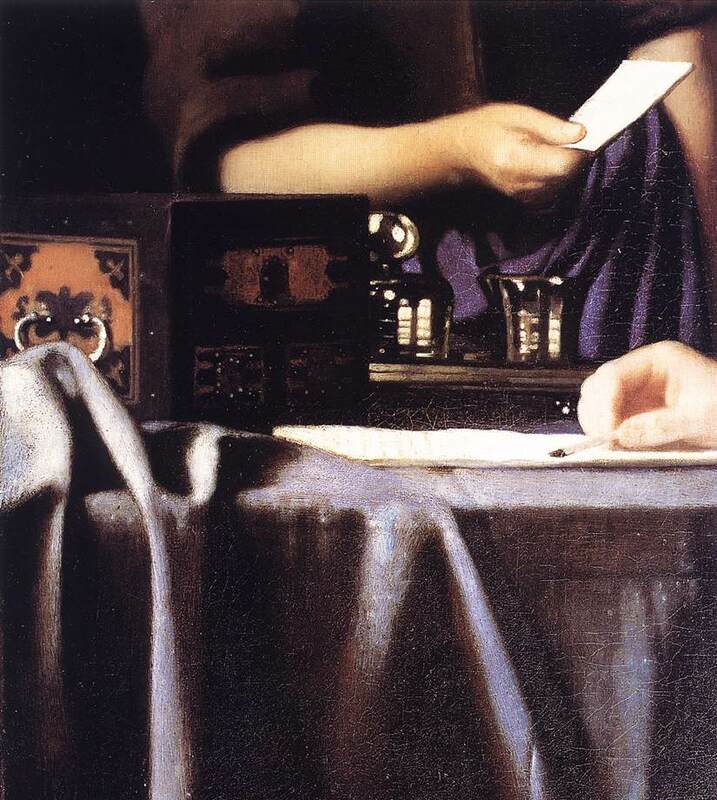 La Fantesca che porge una lettera è un dipinto ad olio su tela (90,2x78,7 cm) di Jan Vermeer, databile al 1667 circa e conservato nella Frick Collection di New York. Assieme a molte opere del pittore, anche questo dipinto è in tutta probabilità citato nell'inventario dell'asta tenutasi ad Amsterdam il 16 maggio 1696, al numero 7, come: «una giovane dama alla quale una cameriera consegna una lettera. Del suddetto. Prezzo: fiorini 70.0». Questa descrizione potrebbe riferirsi anche alla Lettera d'amore del Rijksmuseum di Amsterdam, sebbene in quella tela la missiva è già consegnata. Passò per varie collezioni europee, finché nel 1919, entrò in quella Frick. Fu una delle ultime acquisizioni fatte personalmente dal fondatore della collezione poco prima della morte, e rientrava nel gruppo delle sue preferite. Una cameriera si avvicina alla padrona per porgerle una lettera e questa, seduta a un tavolino, interrompe la scrittura e ha un gesto di sorpresa, posando la penna, guardando la domestica e portando una mano al mento. Come in molti dipinti di Vermeer, il soggetto è ricorrente e in un ambiente chiuso: ragazze o dame che suonano musica, scrivono o leggono lettere, compiono piccole azioni banali e quotidiane come versare dell'acqua da una brocca. In questo caso, il semplice fatto di ricevere della posta viene fermato in un momento di di complicità: la domestica sembra conscia dell'importanza della lettera e la accompagna con qualche parola che sembra interessare molto alla signora. 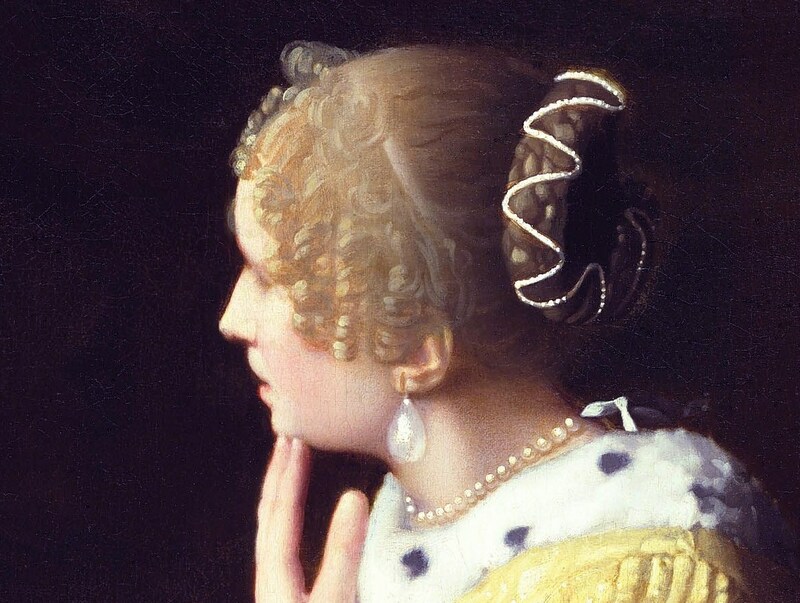 La figura della donna è ispirata forse a quella della moglie di Vermeer, presente anche in altri dipinti: porta un elaborato chignon a treccia, riccioli cadenti sulle tempie, perle agli orecchi e al collo e una casacca di raso giallo bordata di ermellino che davvero appartenne alla signora Vermeer, come dimostra un inventario pervenutoci. La luce fredda che le illumina il volto è analoga a quella della Ragazza con velo. Sul tavolo, coperto da un drappo azzurro, stanno gli strumenti per scrivere e il cofanetto che deve contenerli: foglio, penna e, su un vassoio, boccetta di inchiostro e calamaio, questi ultimi accesi da riflessi luminosi che ne rivelano la lucidità del materiale, forse peltro e vetro. Lo sfondo praticamente uniforme e buio e la mancanza delle rifiniture e dei particolari tanto cari a questo artista nel corpo e sulla testa della dama ci fanno capire che questo lavoro, eseguito a pochi anni dalla morte, è stato lasciato incompiuto dallo stesso pittore. Nonostante l'incompiutezza dell'opera, pienamente sviluppati sono i sottili giochi ed effetti di luce: luccichii dai gioielli di perle, scintillio sugli oggetti, increspature vivide dei tessuti.